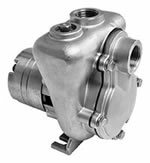 PrimeTime Self-Priming Stainless Steel Centrifugal Pumps. Primetime Pumps were originally designed for marine air conditioning installations where the pump mounting location is prone to air-lock or require suction lift. The Primetime Pump is now seen as a self-priming pumping solution for many applications. Check out the links below or use our handy Search feature. • PrimeTime Pump List - A listing of all the PrimeTime Pumps we carry. • PrimeTime Parts List - A listing of all the PrimeTime Parts we carry.